Having the right handgun with you at the right time could save your life – if you really know how to use it. If you want to “carry” a handgun then you need to make sure that you give a lot of consideration about what works for your specific situation since the main reason for having it is to protect your life and the lives of your loved ones. The criteria that we use to evaluate small handguns are: 1) size, 2) weight, 3) concealability, 4) maximum number of rounds, 5) accuracy, 6) reliability and 7) price. For our everyday gun we like the 9mm Smith & Wesson M&P Shield. 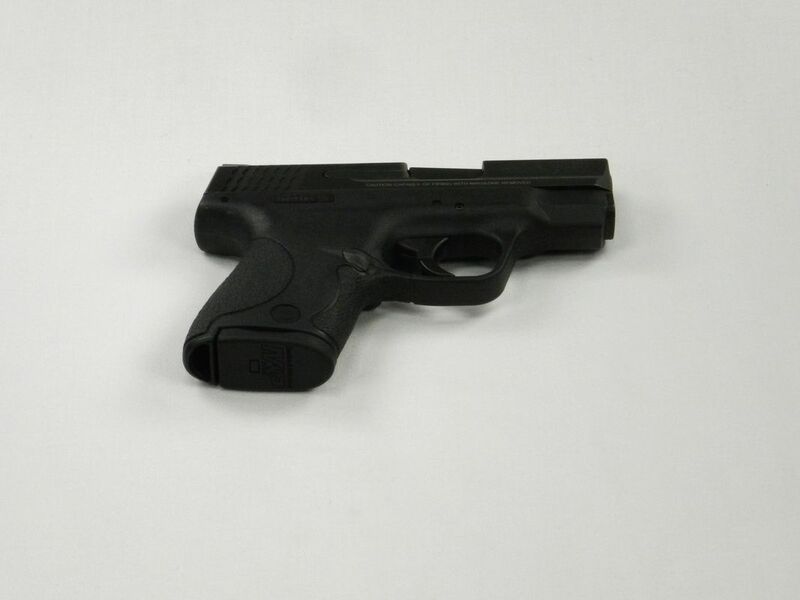 This polymer striker fired handgun measures 6.1" long by 4.6" tall by .95" wide and weighs 19.0 oz (unloaded). The grip is at an 18 degree angle and the sight radius is 5.3". The overall barrel length is 3.1" and the stock firearm has a trigger pull of approximately 6.5 lbs. The magazines come in both 7 and 8 round variants. Because of its small size the S&W Shield is easy to conceal. As a fire striker weapon its performance is very smooth and reliable. The gun feels good in your hand and is very accurate at the ranges you would need to use it at. ​Since the trigger was a little stiff for us we had an Apex Shield Carry Kit (100-076) installed to provide a smooth, consistent trigger pull that is approximately 2 lbs lighter and provides the advantages of shorter pre-travel and over-travel and a more detectable trigger reset. You can buy this handgun at smith-wesson.com or your local FFL dealer. 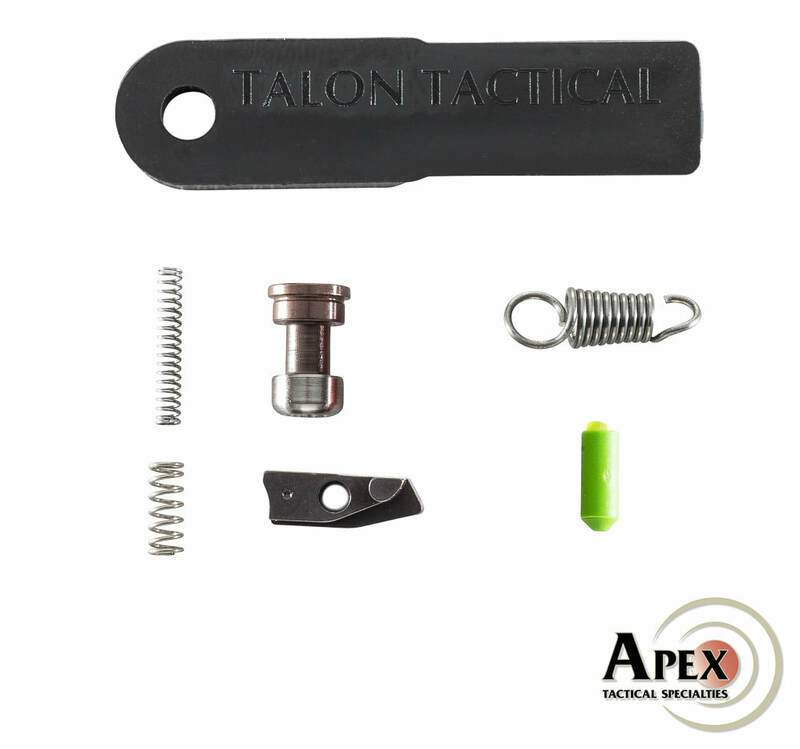 ​Information about the Apex trigger kit can be found at apextactical.com. If you would like to see a detailed YouTube review of the Smith & Wesson M&P Shield - 704 Tactical has a good one here. We’ve used an M&P Shield as our everyday carry (EDC) firearm for the past 4 years and we really like it since it provides a great balance of shootability and concealability. We’re not alone in that assessment as you can tell by the uncounted number of online videos reviewing what makes the Shield such a great EDC gun. So when Smith & Wesson decided to launch the 2.0 Shield in October of 2017 we took a look at it – but didn’t buy one since, although it had some refinements, it was very similar to the Shield that we already had. However, as time progressed S&W continued to develop variants of the 2.0 Shield and at SHOT Show in January 2018, they unveiled the Shield 2.0 with an integral Crimson Trace laser. So we eventually broke down and decided to purchase one. The criteria that we use to evaluate small handguns with lasers are: 1) size, 2) weight, 3) concealibility, 4) maximum number of rounds, 5) accuracy, 6) reliability, 7) manner of laser integration, 8) brightness of laser and 9) price. S&W makes the 9mm Shield 2.0 with both Red and Green lasers – so we looked at both. Although the Shield with the Green Laser cost a little more (~$50), we found that it was easier to see the green laser than the red laser and it was quicker to pick it up – especially in bright light conditions. So we bought the 9mm 2.0 Shield with a Green Laser. 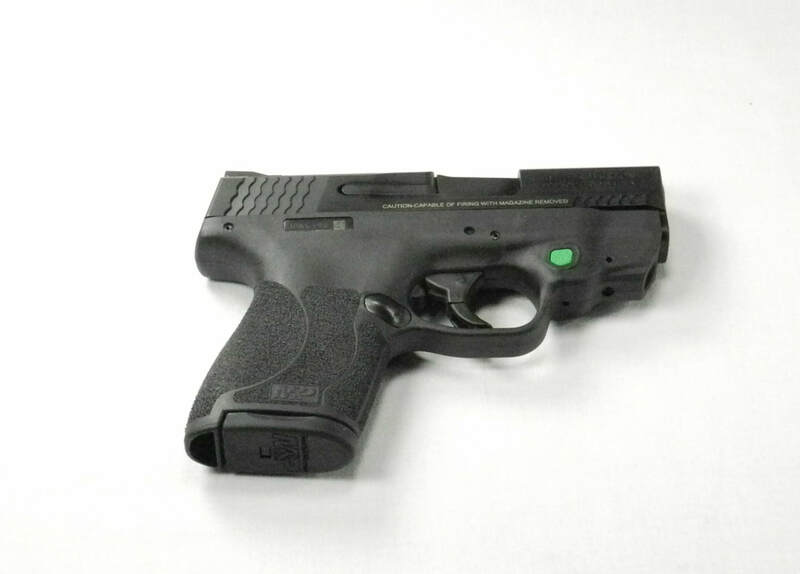 The 2.0 Shield is a polymer striker fired handgun that measures 6.1" long by 4.6" tall by .99" wide and weighs 18.3 oz (unloaded). The grip is at an 18 degree angle and the sight radius is 5.3". The overall barrel length is 3.1" and the stock firearm has a trigger pull of approximately 6.5 lbs. The magazines have a capacity of 7 or 8 rounds (7 is flush-fit and 8 is extended) and the firearm comes with 3-dot sights. Because of its small size the 2.0 Shield is easy to conceal and its performance is very smooth and reliable. The gun feels good in your hand and is very accurate at the ranges you would need to use it at; further for the 2.0 Shield than our original Shield. So what are the differences between the 2.0 Shield and the original Shield? The grip stipling has been changed to give you a better grip on the pistol. It's a significantly rougher, almost like sand-paper, and covers more of the handgrip. The machining on the slide has fishscale serrations toward the front of the slide to give you a better a better grip when required. The 2.0 has a more refined trigger, for a smoother pull, a crisper break and a more audible and tactile reset. ​Even though S&W specifically upgraded the 2.0 Shield’s trigger, we had an Apex Shield Carry Kit for the Shield 2.0 (100-176) installed to provide an even smoother, more consistent trigger pull that is approximately 2 lbs lighter and provides the advantages of shorter pre-travel and over-travel and a more detectable trigger reset. You can buy this handgun at smith-wesson.com or your local FFL dealer. 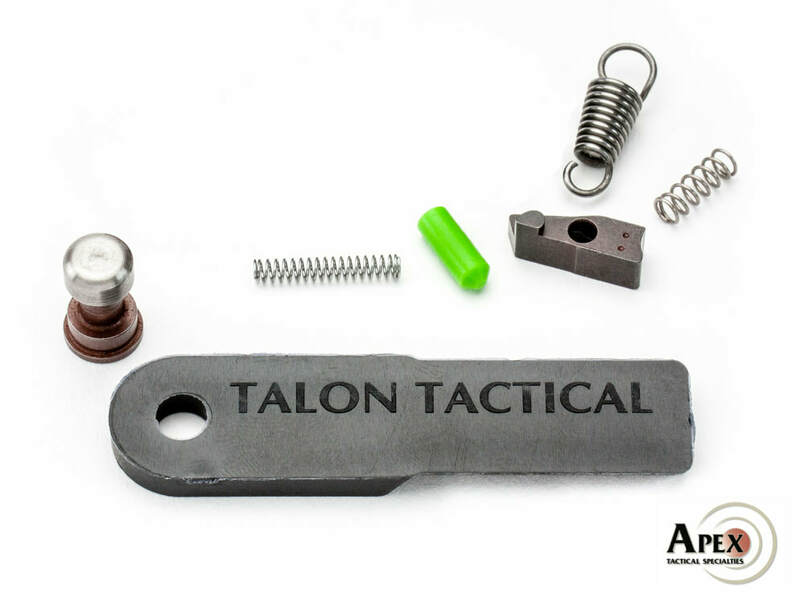 ​Information about the Apex trigger kit can be found at apextactical.com. If you would like to see a detailed YouTube review of the Smith & Wesson M&P 2.0 Shield with an integrated Green Laser – “1776 or Bust” has a good one here. 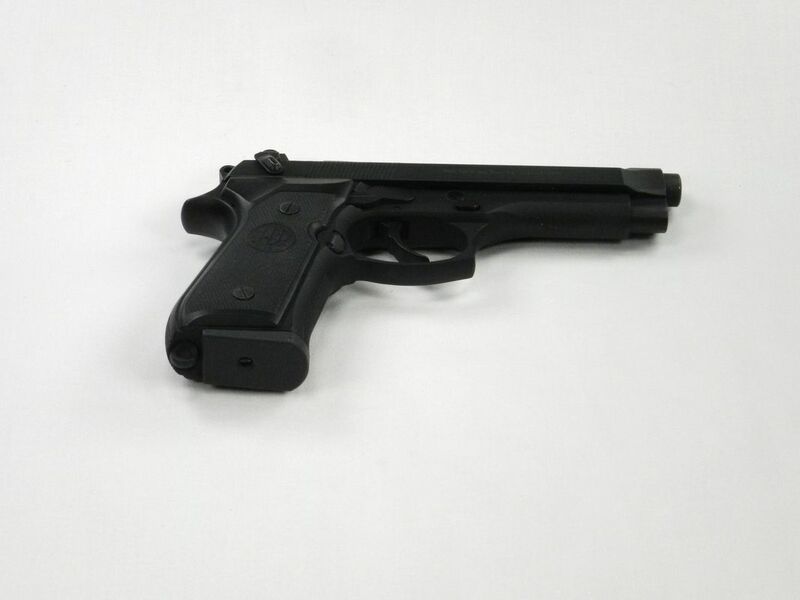 For situations where concealability is not the primary concern we carry a larger handgun; a 9mm Beretta 92FS. The criteria that we use to evaluate large handguns are: 1) size, 2) weight, 3) maximum number of rounds, 4) accuracy, 5) reliability, 6) concealability, and 7) price. The Beretta 92FS is a double/single-action 9x19 caliber pistol that has seen 25 years of use with the Military and Law Enforcement. It measures 8.5" long by 5.4" tall by 1.5" wide and weighs 33.3 oz (unloaded). The overall barrel length is 4.9". The sight radius is 6.1". The magazines come in 10, 15 and 17 round variants. Since I was in the Air Force this was the weapon of issue and I purchased a personal one to enhance my capabilities with it. This is a very capable handgun. It was specifically built and tested to operate in harsh environments without malfunction or breakage. Because of its larger size and weight it has better accuracy at longer distances, and the larger capacity magazines can come in handy if you really need to put rounds downrange. The one downside of the 92FS is that it is really too large to carry in a concealed belt holster, so I have a shoulder holster. You should be able to buy this handgun at your local FFL dealer. ​Information about the 92FS can be found at Beretta.com. If you would like to see a detailed YouTube review of the Beretta 92FS - hickok45 has a good one here.